Michael Berry is our latest Routledge Featured Author. Read our interview to discover more about his recent book, Listening To Rap. "Listening to rap critically—both the music and the lyrics—reveals a great deal about how systems of oppression continue to operate in our country and provides a point of entry into the kinds of conversations that will help to dismantle these systems." Michael Berry earned a bachelor’s degree in music from Temple University. He went on to earn a master’s degree in music theory at Temple, and a Ph. D. in music theory at the City University of New York. His focus was mainly on voice leading in 20thcentury music (the subject of his dissertation). He had two professors who provided him the opportunities to write about rap music: those were his initial ventures into writing about rap. He got his first teaching job at Texas Tech University, he developed a course on rap music and brought it with him when he moved to the University of Washington in 2011. Two-part question: 3a) Why is your book relevant to present day music? 3b) How do you think the field of music is evolving today? I want the audience to recognize that there is a lot we can learn from rap music, if we just listen. As a straight white man, I understand that I benefit from a variety of privileges that members of marginalized communities in this country and elsewhere do not. Rap music provides a platform for members of these communities to share their experiences, and helped me to recognize my privileges. In some cases, the messages are direct; in others, they are mediated by the music industry and society at large. Having the tools to start decoding these messages is essential to advancing the cause of social justice, and the tools are applicable to other media types as well. My hope is that others will start really listening to rap, and thinking critically about what they’re hearing. In 2017, rap overtook rock as the most popular music in America: its influence on our culture is undeniable at this point. But most of rap’s content is consumed uncritically: the genre is tied to blackness, which makes it “cool” for young people to listen to, and also makes it an ideal scapegoat for racist ideologies. Unfortunately, the ubiquity of music coupled with the rise of free or low-cost streaming services I think has resulted in a perceived loss in the value of music: it’s no longer a powerful agent of social change, but rather a kind of sonic wallpaper that exists in the background of our day-to-day activities. Listening to rap critically—both the music and the lyrics—reveals a great deal about how systems of oppression continue to operate in our country and provides a point of entry into the kinds of conversations that will help to dismantle these systems. I wanted this book to be useful to both students and teachers: it assumes no prior knowledge of rap, music, poetry, or other specific topics. I’ve kept the language as simple and direct as possible, using specialized terminology only where necessary (and defining the terms both in the text and in the glossary). There are Spotify and YouTube playlists, suggestions for additional listening, a bibliography of important texts in hip-hop scholarship, and timelines throughout the book. If need be, music students can gloss over the music chapter; poetry students can gloss over the poetry chapter, and so on. I also developed this to serve as a resource for teachers: I imagine a graduate teaching assistant being assigned to teach this class: they should be able to pick up the book, use the discussion questions, bibliography, and selections for additional listening to build lessons quickly and easily. More experienced teachers will hopefully find new ways of approaching familiar material. 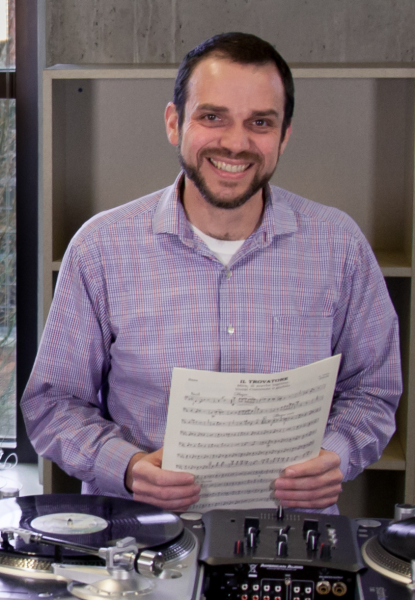 I earned a bachelor’s degree in music from Temple University: I’m actually a classically trained double bass player, and I continue to perform regularly with orchestras in the Pacific Northwest. I love Mozart, Brahms, and Stravinsky as much as I like Rakim, Jay-Z, and Young Thug. I went on to earn a master’s degree in music theory at Temple, and a Ph.D. in music theory at the City University of New York. While my focus was mainly on voice leading in 20th-century music (the subject of my dissertation), I had two professors who provided me opportunities to write about rap music: those were my initial ventures into writing about rap. Not long after I got my first teaching job at Texas Tech University, I developed a course on rap music and brought it with me when I moved to the University of Washington in 2011. During my first few years as an undergraduate, I actually swore off all popular music: I sold all of my pop CDs! I believed that, if I was going to be a classical musician, I needed to dedicate my time to learning classical music as thoroughly as possible. It wasn’t until my last year as an undergraduate that I slowly began listening to popular music again—all work and no play, I guess. Among the first CDs I added to my collection were Cypress Hill’s Black Sunday and Ice-T’s O.G. Now much of my teaching and writing is dedicated to rap and popular music, something I never would have imagined even ten years ago. I have something short that I’m working on for a forthcoming Routledge anthology: it’s a lesson plan for an ear-training class that uses the TR-808 drum machine, one of the most popular instruments in early rap. Beyond that, I’m working on two bigger projects: the first chronicles Philadelphia’s contributions to rap music. When most people think of “east coast” rap, they think of New York. But Philadelphia played an important part in the early days of hip-hop culture, and continues to be a driving force in the genre. I contend that rap music would be very different today were it not for Philadelphia’s role, and that it’s a story that needs to be told. The other project explores how music helps individuals and communities address the aftermath of trauma. It adopts perspectives from music theory, psychology and trauma studies, and several other disciplines to understand music’s role in the recovery process. You can interact with me on Twitter: @listeningtorap! Click on the image below to access a free chapter of Michael Berry's recent book, Listening to Rap.